One word summary for the book- “Process“. We’ve all heard that “Life is a Journey, not a destination.” Dr. Rao examines the true power of this statement. 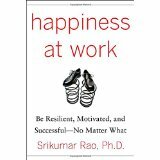 While the beginning part of the book deals with the “at Work” scenario, he then dives deeply into Happiness anywhere, anytime. He reminds us “Passion does not exist in the job. – It exists in you.” At work, or not at work, it really doesn’t matter. Knowing this, why just focus on the work place? He teaches the Process to feel Happiness no matter where you are. That’s what we all really want anyway, right? Personally, I really appreciated and felt strengthened by the ideas presented. I liked the bold, directness of Rao’s “conversation.” He likes to throw a lead question out to you that you think you comfortably know the answer to, and then he’ll state emphatically “NO!”, and follow it up with great clarifying reasoning. He’s got a great mix of stories and examples to help explain the ideas he throws at us. The man has an incredibly extensive vocabulary that had me looking up words I had never heard or used before. Thanks! One of the main ideas in the book is simply Don’t Invest in the Outcome, Invest in the Process. Rao shows that our common “Mental Models” of “If this… Then that” is itself “fallacious”. For example, IF I get this to happen…THEN I’ll be happy. Rao reminds us that the problem of putting off our Happiness contingent upon the Outcome is that we surrender Happiness to something we can’t control. What a powerful insight! Definitely a book I’d recommend to anyone along any part of their path in life. Look for an ancient Eastern flavor to the lessons here. The basic premise that NO things will bring you deep happiness is liberating and a great reminder for all of us. Enduring satisfaction, deep bliss, whether at work or anywhere only comes from within. Invest in your Process of Prosperity and Happiness, be it at work – or along the path of life. By doing this, you’ll already “find the Outcome to your liking”. This entry was posted in Book Reviews, Daily Blogs and tagged feeling happy anywhere, Happiness at Work, How to be happy, If /Then model, Invest in the Process, Real Happiness, Srikumar Rao by MomentumMikey. Bookmark the permalink.